Methodism came to this country from England in 1784. The following year Matthew Greentree and Adam Cloud were appointed as circuit riders to this part of New Jersey. 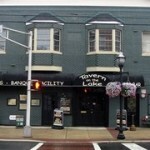 They began to hold regular meetings in a Hightstown Tavern owned by Adam Shaw, which was near the site of the Old Hights Hotel which is the present day Tavern by the Lake. ​In 1786, John McClosky and Ezekiel Cooper were appointed to the circuit and continued to teach at the tavern. However, they were not satisfied to continue preaching at a tavern and stated that they would not return the following year unless a more suitable place was found. A young man, named Robert Hutchinson, heard of the possible ending of the services. Upon returning to his home in Milford (now Etra), he invited his uncle, Joseph Hutchinson, to attend the next services in Hightstown. After hearing the sermon, Josesph Hutchinson invited the preachers to hold regular services in his home instead of the tavern. A Methodist Society was soon organized, and three of the original members became preachers. Soon after the society was organized, Joseph Hutchinson erected a small wooden church which was 30 by 50 feet. The church was located on the east side of Milford, overlooking the pond, and across the road from the cemetery. By 1825, the society had grown to forty members and plans were made to enlarge the structure. When the plans failed, members from Hightstown proposed to return the place of worship back to Hightstown and erect a new building there. So, after fifty years in Milford, the church moved back to Hightstown. All that remains of the Milford church is the cemetery, which was declared an historical site by East Windsor Township. In 1835, a brick church was erected in Hightstown. It still stands on the corner of Church Street across from the present church. From 1835 to 1852, the church was connected with the Allentown and Crosswicks circuit. In 1857, the brick church gave way to a much larger frame building located in the middle of the block on Church Street. This building served as the church until the turn of the century, when the present church was erected. The old frame church was sold to M. P. Chamberlin, who used it for concerts and it became known as the Opera House . Sadly, the frame church was destroyed by fire on April 14, 1929. The cornerstone of our present building was laid in 1898. At that time, the property was about one quarter its present size, but it did include a parking area for wagons and a shed for horses. The pipe organ was installed in 1931. There have been several renovations to the church over the years. Among them are: roof (1957, early 1970's), sanctuary (1946, 1986), heating system (1946, 1996), office (1989), education area (1946), kitchen (1991), and stained glass windows (1970's, 1996). There was a major renovation in the late 90's and early 2000's when our building was declared structually unsafe. After many years out of the building we moved back and completed our major renovations. The entire building was reinforced with steel and is now back in the business of housing many different groups from the community. It has been a challenge to keep our church worthy of being called a house of God. 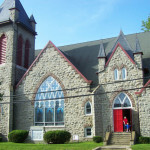 But with over 200 years of dedication by our church forefathers to build upon, the First United Methodist Church of Hightstown will continue to serve the needs of this area for years to come. From The Book of Discipline of The United Methodist Church - 2004. Copyright 2004 by The United Methodist Publishing House.